There was something odd about tonight’s match. Whilst Liverpool desperately need to win some silverware in order for this squad to get the glory that it so richly deserves, there’s something about the League Cup that makes it a tricky one to know how to approach. If you’re not going to win it then you might as well go out early, given the fact that the rounds start to see footballing piling up the further in the competition you go. That the semi-finals are over two legs makes it even more frustrating to see your team progress but then not actually lift up the trophy at the end of it. For Liverpool, though, there’s a special relationship with the competition, given that we’ve won it more than any other club. It means that supporters tend to want the club to do well in it in a way that we aren’t quite as bothered about when it comes to the FA Cup. Don’t get me wrong, we’d all love to win the bigger trophy, but we certainly don’t look on this one as a ‘Mickey Mouse’ competition in the same way as some others do. The drawing of Chelsea this early on in the competition also complicated matters. On the one hand, the cups are normally where you like to give your squad a run out and maybe have a look at some of the kids. On the other hand, getting drawn against a big side helps to clarify the manager’s thoughts on how seriously he wants to take things. The question was, what would Jürgen Klopp choose to do and how would things work out? First things first, then, and the manager’s team selection was the one that we all broadly expected. He told us in the pre-match press conference on Tuesday that he would be starting Simon Mignolet and anyone sensible will have felt that this game was always destined to be Fabinho’s first competitive start for the club. Otherwise it was a matter of rotating where possible and keeping a couple of the first-team lads in the side for the first hour or so. The joy of the new rules, which send the match straight to penalties if it’s level at full-time, meant that it allowed Jürgen Klopp to think about making an early change as he knew that whoever he sent on wouldn’t be asked to play an extra hour if the game wasn’t won in normal time. Whether you think his selection worked or not will largely come down to what you want from your football team. The reality is that Chelsea were totally dominant in the first-half yet they never really looked like scoring. There was one moment when Cesc Fabregas played a brilliant ball through to Alvaro Morata that the striker couldn’t quite get past Mignolet, but other than that they demonstrated something of the sterile dominance that Arsenal were famous for. The Reds, meanwhile, lacked fluency but had much the better chances in the opening period. It took a free-kick that shouldn’t have been given and an absolute wonder-strike by Eden Hazard to break us down, so the manager would likely point to his starting eleven being the right choice, even if it didn’t lead to us getting the right result. In terms of talking points from tonight, I think it’s fair to say that English football is significantly more difficult than people seem to think. Look at Alvaro Morata, for example, who was scoring one in two for Real Madrid before his move to London but doesn’t look as if he could hit a barn door with a banjo for Chelsea. Closer to home, I think we saw tonight exactly why Fabinho hadn’t started for us up until now. For large periods of the match the game seemed to pass him by entirely and he struggled to get into the game at all. Little wonder, then, that the manager has been giving him time to get up to speed. As an aside, I find it interesting that he passed backwards and sideways so much during the match. Anyone would think that it was managerial instruction given to the defensive midfielder chosen by the manager. He isn’t the only new signing that looks to me as though they’ve been slightly surprised about the speed and ferocity of the English game. I said in the wake of the West Ham match at the start of the season that people were getting carried away with Naby Keita’s performance. I thought that he was very good but that he still has a long way to go before he should be earning Man of the Match awards. In the Bundesliga the Guinean would dominate games for fun, running things from midfield and creating goals out of nothing. In the matches that I’ve seen him appear in for us so far he’s been decent but not exceptional, seemingly wanting a little bit longer on the ball than he’s going to be allowed by opposition defences and struggling to be quite as dominant as he was in Germany. I still think that he’ll be something else when he really hits his stride, but for now I think he needs time to adapt his game and we saw that play out tonight. There’s literally no way of knowing if our first-choice back five would have been able to see the game out tonight once we took a one goal lead. They’ve been keeping clean sheets for fun, especially at Anfield, but I’m not sure what they would have done to stop the Eden Hazard wonder goal, for example. One thing we can say without any doubt, however, is that our defence has improved markedly in the past year or so. There was a time when Simon Mignolet was a nailed-on starter, Joel Matip and Dejan Lovren were the first-choice centre-back pairing and Nathaniel Clyne and Alberto Moreno were pretty much the only option that the manager had available to him in the full-back slots. That we have improved so much this season is testament to just how far we’ve come in a defensive sense, with all of our first team five offering a huge amount of solidity. It’s an interesting tactic by Liverpool tonight. Using a time machine to select their back four and goalkeeper has never been done before. In fairness to them all, the players selected by the manager didn’t actually do an awful lot wrong. 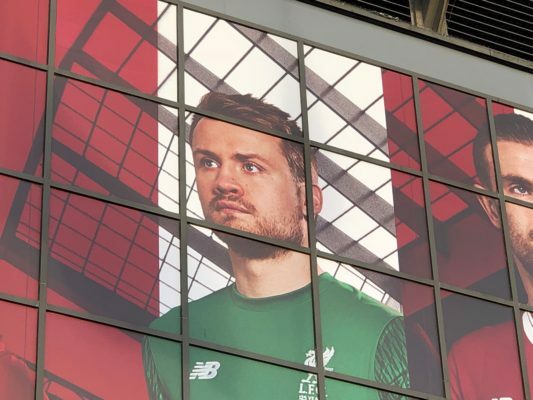 I have been critical of the decision to start Mignolet, but not because I think he’s completely incompetent or useless, more because I’m just sick to the back teeth of watching him play. Aside from anything else, we know exactly what his level is and what sort of performance we’re going to get from him. We’ve learnt nothing about the reserve goalkeeper tonight when, in my opinion, it would have been much more interesting to play Kamil Grabara and see if he’s got what it takes to step up and be a number two. It is fatigue rather than any kind of hatred that has made me wish to never see the Belgian in goal again and tonight shows why. He didn’t do anything wrong, he just didn’t do all that much to excite or thrill either. It’s perhaps somewhat understandable that the rest of the defensive unit struggled at times. Lovren hasn’t kicked a ball in anger since the World Cup final and Matip must have been surprised to start a game rather than just come on in place of Trent Alexander-Arnold for five minutes at the end of a match to totally destabilise the defence. Nathaniel Clyne probably looked the most solid of the back four, though he also showed his limitations in an attacking sense. Though Alexander-Arnold still has so much to learn, the extent to which he’s a more thrilling prospect in the final third cannot be understated. As for Alberto Moreno, perhaps the less said the better. He looks like he’s having a lovely time, a lot of the squad seem to like him and he’s probably on relatively low wages. Other than that, I can’t think of much to say about him that’s worth typing. Watching Alberto Moreno makes you realise just how wonderful Andy Robertson is. For me, tonight showed why a defence can be such a difference maker. It’s not that we were poor at the back, it’s just that we weren’t particularly good either. Our first-choice defence is one that can win trophies, whilst the one we put out this evening has a glass ceiling. That we’ve improved so much is testament to the manager’s abilities as well as his patience. He could have come in and done a clean sweep of the entire backline, but instead he took his time, assessed the abilities of those that he had at his disposal and improved on them whenever the opportunity to do so came about. I still think all of Matip, Lovren and Clyne will have plenty to offer moving forward, coming in every now and again when someone is injured or fatigued and allowing them to have a rest. The problems don’t arise when any of them play individually, as we witnessed when Matip came in against Southampton, it’s when they’re changed completely. Something I hope we won’t have to see again. I have made no secret of the fact that I am a massive fan of the Video Assistant Referee. I think that, when used properly, it is a brilliant tool that will help referees get more right than wrong. We saw in the World Cup just how influential it can be in helping officials made correct decisions that they might not otherwise have been able to make. It’s not a system without problems, however, and one of the biggest issues is that there’s nothing it can do about a referee with an agenda. I’ve long thought that Kevin Friend is a referee that heads to Anfield determined to prove that he won’t be ‘influenced’ by the home crowd and so it proved this evening. He was poor all game, giving Chelsea free-kicks every time one of their players went to ground and then letting them away with a talking to when they did the exact same thing that he’d booked one of our players for earlier on in the match. There’s nothing that VAR can do about that, nor is there anything it can do about the free-kick given against Keita for a foul on Victor Moses when he won the ball cleanly. It’s little wonder, then, that some people have taken against it. It should have been able to spot that Barkley was offside for the equaliser, too, and that’s unforgivable. I still think that the long-term future of football is to see it introduced more heavily, but tonight showed why the system’s only as good as the people in the control room. Wierd feeling after that. I feel more deflated than I thought I would be after a close run defeat with a completely changed line up. Thought we defended well enough for a unit that’s not played for 4 months or more. Midfield was ok for a unit that’s not played together. The front line did ok. Loads of 6.5/10 performances across the board with no one better or worse than that. Chelsea played well in spells but nothing that had the fear of god running through me. So not sure why I am that down about it.